At Children's Worship Bulletins, we believe that when children are given a bulletin of their own each week, they will know that worship is for them too. Because of this, we've designed our bulletins specifically to help your children interact with the Scriptures in new and fun ways. The bulletins are packed with Bible-based puzzles, word searches, seek-and-finds, dot-to-dots and many more age-appropriate activities. With other bulletin subscriptions, you get one bulletin design for a predetermined Scripture for that week. 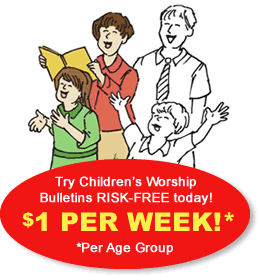 With Children's Worship Bulletins, you get weekly bulletins that follow your choice of Scripture plan or Lectionary. Plus, you always have the option to download any of our bulletins directly from our website. OK, but what kinds of activities can you do with Children's Worship Bulletins? There are thousands of Children's Worship Bulletins available for download, making the number of possible activities you can create using our bulletins endless. And it's easy to coordinate activities for each bulletin. In this short article, we've shared two Sunday school activities about Hagar and Ishmael, just to demonstrate how easy it is. Sunday school activity about Hagar and Ishmael for ages 3-6: God told Hagar to look. Give each child a bulletin and some crayons or colored pencils. Have the children complete the "God told Hagar to look" bulletin while you read aloud the story about Hagar and Ishmael in Genesis 21:8-21 to the class. Referring to the bulletin "God told Hagar to look," ask the children who is missing from the picture. You may have to read the first part of verse 17 again. Try to get the children to identify that the angel of the Lord is not represented in the picture. Ask the children to draw the missing angel into the top and bottom pictures of the puzzle. Have them color both pictures. Sunday school activity about Hagar and Ishmael for ages 7-12: What happened next? Read aloud the story of Hagar and Ishmael in Genesis 21:8-21. Ask the students to complete the "What happened next?" word puzzle. What was God's promise to Abraham? Do you think Abraham told Sarah that God promised to make Ishmael into a nation as well? Do you think Sarah would have asked Abraham to send Hagar and Ishmael away if she had known? Why do you think Abraham gave Hagar only a skin of water and some food? Would that be enough to sustain her and Ishmael for a trip through the desert? How does this story show us that God's will is done no matter what we do? Who is the rest of the Bible about? Are we descendants of Abraham? Of Ishmael? Of Isaac? With the simple click of your mouse, you can download as many different bulletins as you need. No time to look for a new bulletin each week? If you prefer, we will send you bulletin choices on Mondays based on Lectionary readings. The email will contain links to bulletins from the Old Testament, the Gospels and the Epistles.